Tinier than the AIDS virus—that is currently the circumference of the smallest transistors. The industry has shrunk the central elements of their computer chips to fourteen nanometers in the last sixty years. Conventional methods, however, are hitting physical boundaries. Researchers around the world are looking for alternatives. One method could be the self-organization of complex components from molecules and atoms. 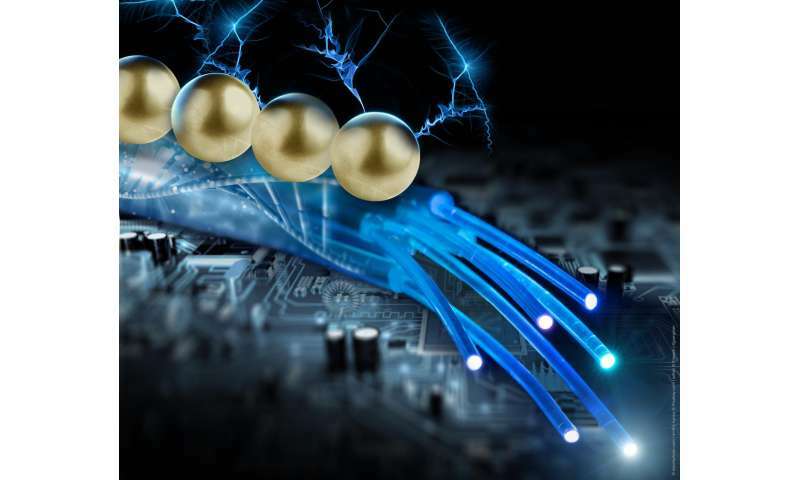 Scientists at the Helmholtz-Zentrum Dresden-Rossendorf (HZDR) and Paderborn University have now made an important advance: the physicists conducted a current through gold-plated nanowires, which independently assembled themselves from single DNA strands. Their results have been published in the scientific journal Langmuir. At first glance, it resembles wormy lines in front of a black background. But what the electron microscope shows up close is that the nanometer-sized structures connect two electrical contacts. Dr. Artur Erbe from the Institute of Ion Beam Physics and Materials Research is pleased about what he sees. "Our measurements have shown that an electrical current is conducted through these tiny wires." This is not necessarily self-evident, the physicist stresses. We are, after all, dealing with components made of modified DNA. In order to produce the nanowires, the researchers combined a long single strand of genetic material with shorter DNA segments through the base pairs to form a stable double strand. Using this method, the structures independently take on the desired form. "With the help of this approach, which resembles the Japanese paper folding technique origami and is therefore referred to as DNA-origami, we can create tiny patterns," explains the HZDR researcher. "Extremely small circuits made of molecules and atoms are also conceivable here." This strategy, which scientists call the "bottom-up" method, aims to turn conventional production of electronic components on its head. "The industry has thus far been using what is known as the 'top-down' method. Large portions are cut away from the base material until the desired structure is achieved. Soon this will no longer be possible due to continual miniaturization." The new approach is instead oriented on nature: molecules that develop complex structures through self-assembling processes. The elements that thereby develop would be substantially smaller than today's tiniest computer chip components. Smaller circuits could theoretically be produced with less effort. There is, however, a problem: "Genetic matter doesn't conduct a current particularly well," points out Erbe. He and his colleagues have therefore placed gold-plated nanoparticles on the DNA wires using chemical bonds. Using a "top-down" method - electron beam lithography—they subsequently make contact with the individual wires electronically. "This connection between the substantially larger electrodes and the individual DNA structures have come up against technical difficulties until now. By combining the two methods, we can resolve this issue. We could thus very precisely determine the charge transport through individual wires for the first time," adds Erbe. As the tests of the Dresden researchers have shown, a current is actually conducted through the gold-plated wires—it is, however, dependent on the ambient temperature. "The charge transport is simultaneously reduced as the temperature decreases," describes Erbe. "At normal room temperature, the wires function well, even if the electrons must partially jump from one gold particle to the next because they haven't completely melded together. The distance, however, is so small that it currently doesn't even show up using the most advanced microscopes." In order to improve the conduction, Artur Erbe's team aims to incorporate conductive polymers between the gold particles. The physicist believes the metallization process could also still be improved.